Alchemy | The Goose Is Out! If you were at our second singaround in March 2011, you are bound to remember the brilliant harmony trio who brought the whole pub to a complete standstill, even the non-folkies in the other bar! That was Alchemy, who had come to East Dulwich all the way from the outer depths of Kent …. Friendship and a mutual love of unaccompanied singing have brought together these three fine voices. Mike Nicholson, Lesley Massey and Tony Petty have combined together as Alchemy to produce a unique blend of harmony with a full rich sound. 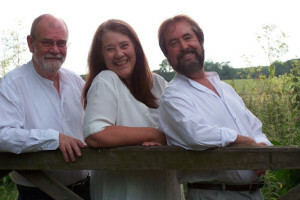 As accomplished performers, Mike has enjoyed a long and illustrious career as a singer and musician and continues to be much in demand on the folk club and festival circuit whilst Tony and Lesley remain busy in their separate careers while maintaining their smallholding in Kent and performing around the country as the very popular duo Capella. Interpretation and musicality are central to the performance of a wonderfully varied repertoire which is drawn from the tradition, both old and new, and which is increasingly earning Alchemy a reputation as having one of the most distinctive vocal sounds to emerge in recent years. Highlights of their first “proper” Goose gig were a version of A Blacksmith Courted Me about an accountant, and Come All you Maids Who Live At a Distance about trucking on the M25 ……. sadly I shall never be able to hear the original songs again without cracking up with laughter ….. They did a great mix of other things as well. They’ll be back! Click here to go to Alchemy’s website!